Buy Honduran Cigars Online Cigar Connoisseur UK. 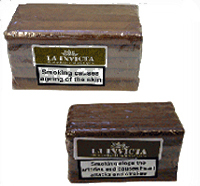 Buy La Invicta Honduran Cigars online from Cigar Connoisseur based in the UK, are available in Bundles and are great value in the following sizes Churchills, Coronas, Panetelas, Petit Coronas, Gordas, Maduros and Tres Petit Coronas which are a cheaper price than most other cigars of the same quality. Available from Online Cigar Specialist. Buy Don Ramos Honduran Cigars at cheap prices online from Cigar Connoisseur based in the UK, These cigars are available from this Online Cigar Specialist - untubed in Bundles in the following sizes Minutos, Petit Coronas, Coronas, Magnums, Churchills, Epicures and in tubes, Churchills, Epicures, No1, No2 and No3.